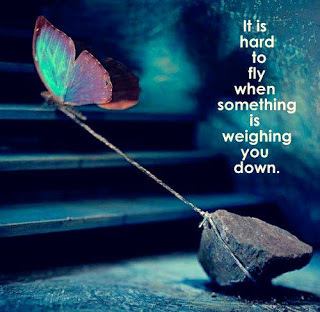 Is Negativity weighing you down? When I made the decision to lose weight, I told NO one. Why? I was afraid of FAILURE. Having to answer to myself was bad enough. The last thing I needed was to have more people pointing out that I was a failure. Little did I know though, that public accountability would become my BEST FRIEND because it kept me from quitting and throwing in the towel like I wanted to, so many times. Once I completed 30 days of P90X and was 15 days into my coaching career, I just asssumed that all of my “friends”, the ones that I used to talk to weekly, party with, gossip with would be my biggest supporters. I never expected everyone to jump on board with me and vow to drink Shakeology and do P90X. But I just asssumed that everyone would cheer me on, tell me that they were proud of me. It’s funny some people who I used to consider my close friend, never even realized or maybe they did and didn’t care, that all of 2011 I was a TOTAL WRECK. I hated myself and our marriage was on the brink of divorce, not because we didn’t love one another, but because we had no goals and were living a life of mediocrity laced with lots of bad habits ranging from poor communication skills, two sets of dreams and reality and lots of drinking. It seems like when I was a wreck, I wasn’t forgotten. I was always invited places. And then the second I started doing something positive and productive with my life, those same people who liked all my Facebook statuses related to drinking or some negative post, all went mute. I just assumed that they would all be happy that I finally was no longer miserable and that I was learning to find happiness and my marriage was stronger and my future seemed brighter. Boy was I wrong! It really bothered me the first few months. Why? Because no one likes change. And no one likes to feel rejected. Then I took a long look around and saw that STRANGERS, many, many strangers, had become my BIGGEST supporters. They were positive. Excited for me. Cheering me on from across the nation. They could read me like a book even from 1,000 miles away and could tell if something was wrong. Then it dawned on me. True friends aren’t always people you grew up with, people you have long history with, people right in your back yard. True friends are those who want what’s best for you and are intuitive enough and care enough to know when something is wrong and actually take the time to ask you if you are okay. True friends are the ones who support you even if they don’t agree or don’t want the same things in life. True friends don’t just stick around when they feel their life is better than yours. True friends are not threatened, resentful or envious of your success. Once I really examined everything and realized that I should be lucky that the negative people who I had been surrounded with, really did ME a favor by becoming absent in my life and then I was allowed to be blessed ten fold by hundreds of people from all over the United States who truly want me to succeed and love watching me become a better version of myself. All I can do is hope that the others who got left behind, one day see the value of investing in themselves and that they deserve so much more than they are settling for and find true happiness in themselves instead of being filled with ego, which causes them to feel and think bad thoughts about others who are doing what they think is impossible. Remember this: You cannot expect positive changes in your life if you surround yourself with negative people. Don’t waste 59,999 on negative, limited thinking. Those people who say “People never change.” only believe that because they have a hard time changing themselves! The truth is, you CAN change. You have two choices when it comes to responding to negativity: prove them right or prove them wrong. Let it motivate you or let it defeat you. It’s sad when people you KNOW become people you KNEW. When you can walk past someone like they were never a big part of your life. How you used to be a…ble to talk for hours, now you can barely look at them. But when you get rid of negative people and negative thoughts, positive things start to happen. And I truly believe things fall apart, so that others can fall together!